When my friend Rev Anne Burkett first gave me a Peace Mala bead bracelet as a gift, and told me how the organisation came about, I thought what an amazing and innovative concept it was. The idea of using small coloured beads strung together on a piece of elastic, each colour representing a different faith path, really resonated with me and seemed an ingenious way of encouraging adults and children to develop an awareness of the importance of not only tolerance, but complete acceptance of the beliefs of others. The accompanying message and 'mantra' of the Peace Mala to 'TREAT OTHERS AS YOU WOULD WISH THEM TO TREAT YOU' serves as a poignant reminder for every human being, if true and lasting peace is to be achieved in the world. The whole ethos and message of the Peace Mala project seemed to echo those of the One Spirit Interfaith Foundation and Seminary with whom I had been training for two years to become an Ordained Minister; so when we were asked to suggest ideas for a present for our Tutor at the end of the course my immediate thought was the silver Peace Mala bracelet. Each one of the tiny silver beads has carved into it a different faith symbol and is therefore unique, just as each one of us is unique; and each bead is threaded and connected by the strong central core, just as we are also all connected to one source which holds us and connects us - Unity in Diversity! 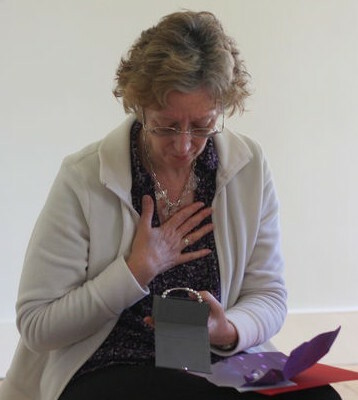 We presented the Solid Sterling Silver Bespoke Peace Mala to our tutor, Rev Elaine Walker at our end of course retreat the day before our ordination, but before Elaine put it on every one of us in the group held it and blessed it. Elaine was absolutely delighted to receive it commenting that 'there couldn't be a more perfect present for me'. She wore the Peace Mala the following day at the Ordination ceremony in London as 40 unique and wonderful individuals joined together to publicly make their vows to be the presence of love in the world and to minister to everyone regardless of their race, gender, religion or belief system.